It's August already! The year is a bit more than half over. This time of year is often a time for reflection, and perhaps a bit of anticipation of the possibilities the remainder of the year may hold. Those of us going to school will start preparing for another period of schedules, lectures, and late night study sessions. Those of us who work may look forward to the next holiday break (in the U.S. that would be Labor Day, 09/01/2014). Those of us who enjoy Apple's ecosystem will be looking forward to the announcement and subsequent release of new hardware and software, the most anticipated of which is the iPhone 6 and iOS 8. Looking into the future is fun and all, but I'm also a fan of living in the moment and at this moment I am enjoying my iPad, iPhone and some of the zillions of apps that make the platform worth having. Many of those apps are free. Not freemiums or hobbled tease-ware, but full featured free apps. I will admit that some are ad supported, but the really good ones have struck a reasonable balance between revenue earning and obnoxious advertising. So, without further ado, here are four of my favorite freebies. I'm not a news hound. While I will try to stay abreast of major events in the world, what passes for news these days really does not interests me. Still, there are a lot of things going on in the world that does interest me, but that stuff is often buried in the noise. That's why I enjoy apps like NPR News, Now This News, and Digg. I look to Digg to give me stories I'd never find otherwise. The service points out historical, controversial, comical, and unusual articles along side headliners so I get a nice balance. And it's not just articles gleaned from other sites, Digg now features videos too. If you subscribe to the service you can get email notifications (my preferred notification method) of current leading Digg articles, and on the weekend you'll get a list of videos you might have missed during the week. 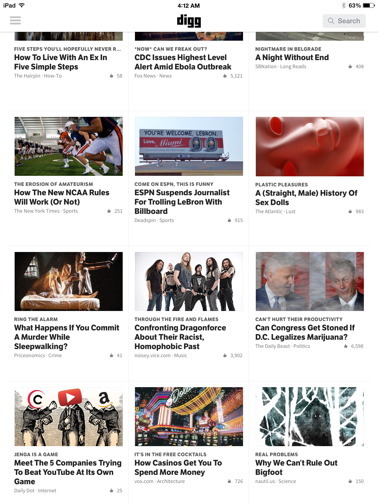 The Digg reader for iOS is simple and easy to use. 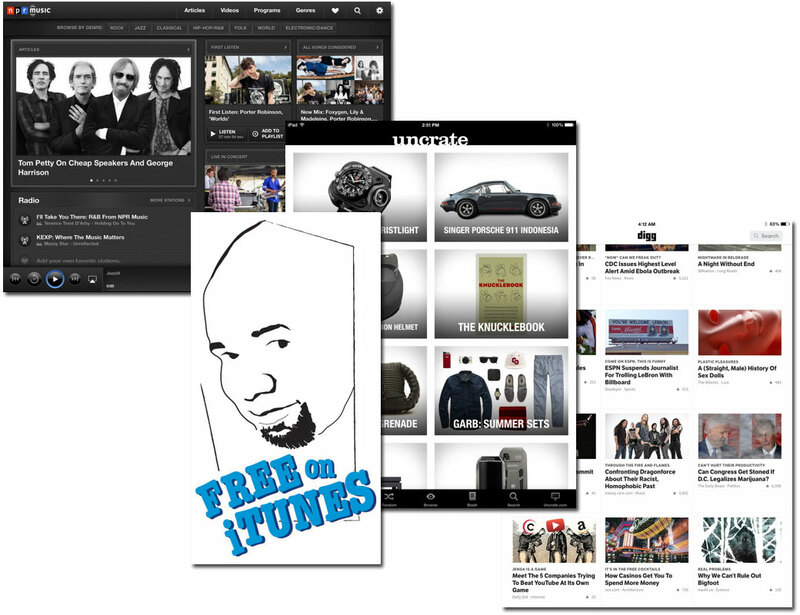 Just scroll through the list of articles, tap the ones you're interested in and enjoy. Each article can be viewed in its original internet presentation, liked via your social service of choice, saved for later enjoyment, and shared via the usual suspects. You can even AirDrop the link. While not completely ad free, ads in Digg are usually unobtrusive. There are times when overzealous ads from the originator's site gets through, but that can't be helped and you can usually get pass them quickly enough. Digg along with NPR News and Now This News make up my morning news ritual. Check it out. You might make it part of yours. One reason I so enjoy the internet is because it can give access to all sorts of things that we never would have known existed. Camp stoves that not only burn fuel so efficiently that you can cook an entire meal in the wild with just a few twigs AND charge your devices while doing so (Biolite), powered skateboards(Boosted Boards), Trek-like tricorder devices that plugs into your iPhone (Lapka monitor), and the list goes on. I likely would never have found any of that without Uncrate. A deceptively simple app that locates some of the most strange, fun, useful, and intriguing products that can be found anywhere. Look through the latest offering, or what's popular, or let the app find stuff randomly (my favorite option). 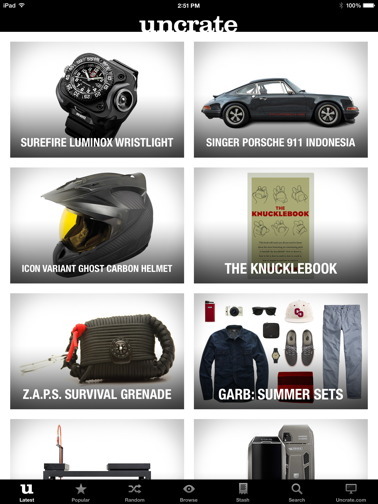 Or you can browse via categories. This is a great app to find gifts for those on your list who's hard to buy for. Getting out and doing stuff on your own is fine, but often an outing can be more fun if you do it with like minded people. But how do you find them? Meet Meetup. Create a profile and find groups doing things you'd like to do in your area. It's just that simple. 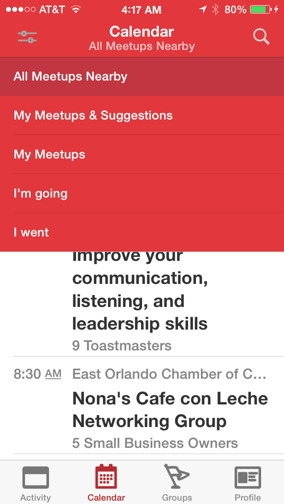 Meetup centralizes groups, giving people a place to setup events and invite anyone interested to attend. It's a great concept and it works. I've gone on several kayak outings and have met some great people. The iOS app is a front end to a service that's been around for a while. The app lets you browse groups, view suggested meeting based on your preferences, sign up for a meetup, comment, and even post photos of the event. Each event lists attendees and lets you know if the event is full. If so, you can join a waiting list. The app also automagically adds events you'll be attending to your calendar, complete with location and event details. This app is great if you're new in town or looking to get out of the house more. I'm a music agnostic, I pretty much don't care what genre a tune falls into, if it sounds good, I'll listen to it. If you look at my music collection you'll find anything from a cappella to zydeco. Discovering new music used to be a problem for me, but not since I started listening to NPR Music. The app offers album previews, articles, videos and more of artists you may know and artists you definitely don't know, but will want to. You even get concert videos, which is great on its own. 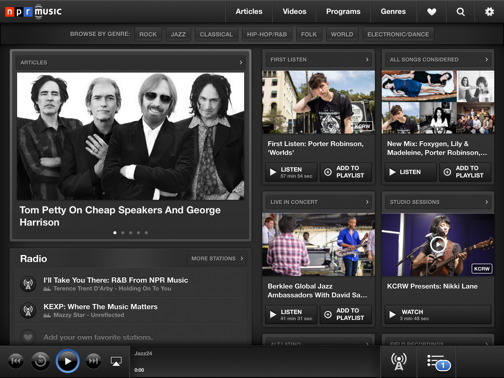 If that wasn't enough NPR Music also gives you access to hundreds of affiliated stations with genre spanning programming where you are bound to find something you'll like. This app I return to time and again. Check it out.